IMPORTANT Our regular meeting night for 2019 is the SECOND Thursday of the month: May 9, September 12. Our October meeting will be on the third Thursday, October 17 (the week after Hershey). Our annual Charter Luncheon was held on March 24 instead of a Thursday meeting. Our June meeting will be a Tailgate party at Johnson's Farm on a Friday night in June. There will be no meetings in July and August. There will be a Breakfast meeting at a local diner in November, and our Holiday Party will be in December. Keep watching the calendar for last minute changes. Regular meetings are held in the Haddonfield Borough Hall, 242 Kings Highway East, Haddonfield NJ, on the second floor, starting promptly at 7:30 pm. On March 24, 2019, Ankokas held its 55th Annual Charter Luncheon at the Merchantville Country Club. The luncheon celebrates the anniversary of the founding of Ankokas and brings together all members for a good time of conversation and food. President Joe Dougherty announced several club events coming up in the next few months, so be sure to check the Calendar often. A Thank You plaque was presented to club member and sponsor Tom Amendola for his support of Ankokas. The highlight of the day was the presentation of the Frank Hankins Memorial award, presented to the club member who has stood out for their work and support of Ankokas. This year, Kathy Petters was honored for her work as our first woman as Region President for the past two years, organizing our car show registration, and years of support for all of our club events. To see pictures from the luncheon, click over to the Past Ankokas Events photo gallery page. On June 2, 2018, the AACA held their Grand National Meet in Greensburg PA. Three Ankokas members were in attendance showing their cars. Bob and Kathy Petters (top left) received their Repeat Preservation award for their 1940 Oldsmobile 90 Series. Carl Villone (bottom) received his First Grand National for his 1978 Lincoln Continental Mark V. And Sam Mento (top right) received his Repeat Senior Grand National for his 1966 Mercury Comet Cyclone GT. Congratulations to our winners. If you need a club ID badge please email Carl Grossman at clgrossman1@verizon.net. Every club member should have a badge to wear at events. 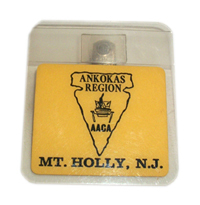 The badge identifies you with Ankokas and can aid in recruiting new members. Pictures of our tour of the Atlantic City Convention Hall Pipe Organ have now been posted Atlantic City Pipe Organ Tour of the Past Ankokas Events gallery. An audio clip recorded from the free concert after our tour is now posted on our BLOG page. If you missed the tour, you missed a spectacular tour. Every Wednesday at 10:00 am, Boardwalk Hall offers a tour of the building and inside the chambers where the pipes are located. You are actually walking through the organ, not just looking at it. After the tour is a concert that shows just how grand the pipe organ can sound. And it's all free. Yes, FREE, no charge. You really need to take the kids and grand kids to see this. Don't delay. Do you have some news you want to share with the club? Bought a new old car? Have some spare car parts you want to sell, or something you need for your next restoration project? Let us know about it. Send it to newsletter@ankokas.com and it will be posted on the website and in the newsletter. Let's hear from you!! !